It is so moving to watch those peaceful pictures and so intimate that i can feel the beating heart of those little creatures ! That is exactly the sort of response I was hoping these images would rouse. Ahhh lovely, Karen. 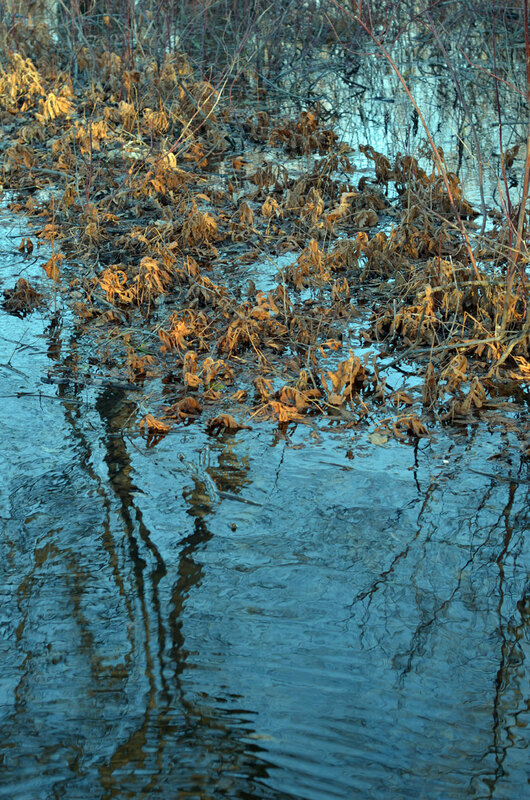 Probably my favourite winter pastime, walking in the river valley and feeding chickadees. Magical, wondrous little creatures. Thanks for this! Yes, one of the delights of winter for sure. I adore these little creatures! Have you snow yet, Sydney? We are still all brown and earthy here. Thank you, the models are pretty sweet! I glad you enjoyed them, thank you! A quiet joy indeed! You can feel the lightness and the quick movement, small elements of stillness to balance it off. Hi Anna, thanks for your words. 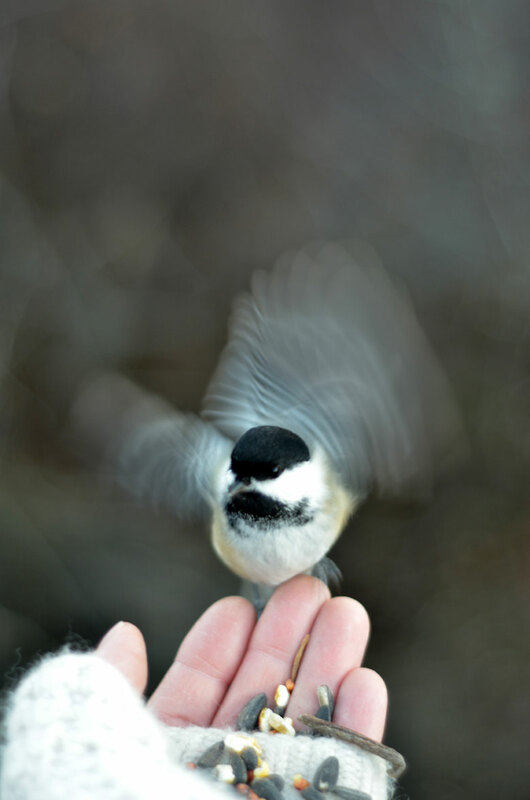 The chickadees wave hello! Beautiful. The long exposure gives a real sense of graceful flow to their normally flitting motion. 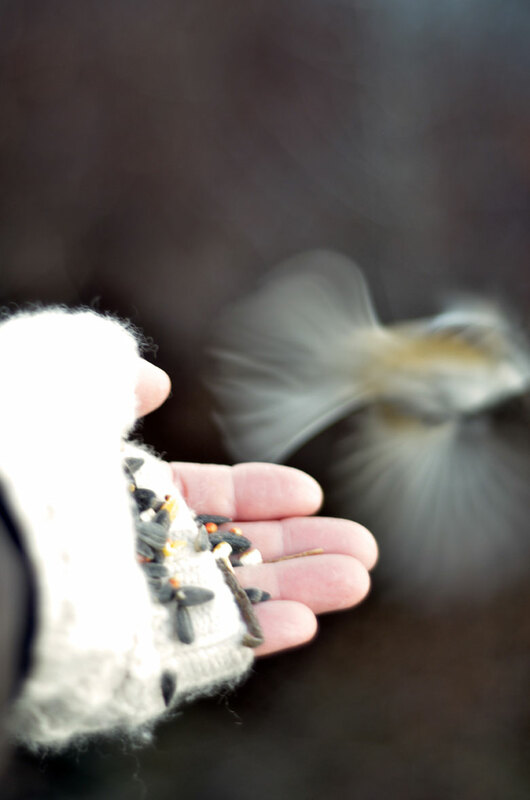 Oh, the lightness of those little chickadees! These really are so lovely! Beautifully soft – gentle – and so peaceful. I can feel the wind from their wings. The colors are wonderful, too, Karen. wonderful series, Karen. I like them a lot, so tender and beauty! 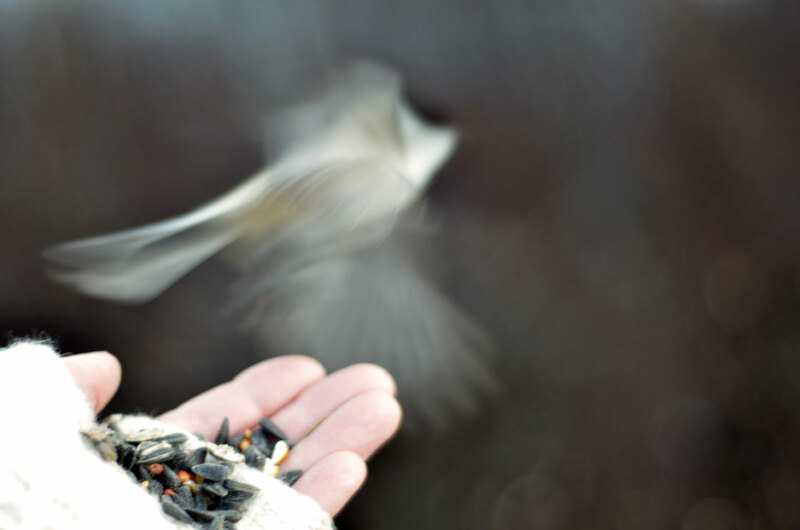 How lovely and sweet, I do know the gentle landing on your fingers. A feeling you never forget. The exhilarating silence of Mother Nature feeding your soul. Wunderschön, Very beautiful 🙂 ! What a wonderful Monday treat, Karen…. did I say Monday? Great pics and great sequence!!! I just held my breath when I saw these! They perfectly capture the sensation – or how I imagine it must feel, because I’ve never had such an extraordinary experience in real life, and can only sense the feel and the magic of it from your wonderful pictures. Thank you so much! Oh Karen these are so beautiful. I laugh. You are sooooo good 🙂 Thank you for these sweet joyful photographs. Fantastic. The long exposure makes the bird otherworldly, like a spirit of the woods or some magical creature. Fantástica y evocadora serie fotográfica. Saludos. I love these little guys and watch them with delight when they visit our feeder. But, these images bump up my experience with your extra special joy. Marvelous! And not to slight the last image-those colors….another dose of pure joy. Yes! 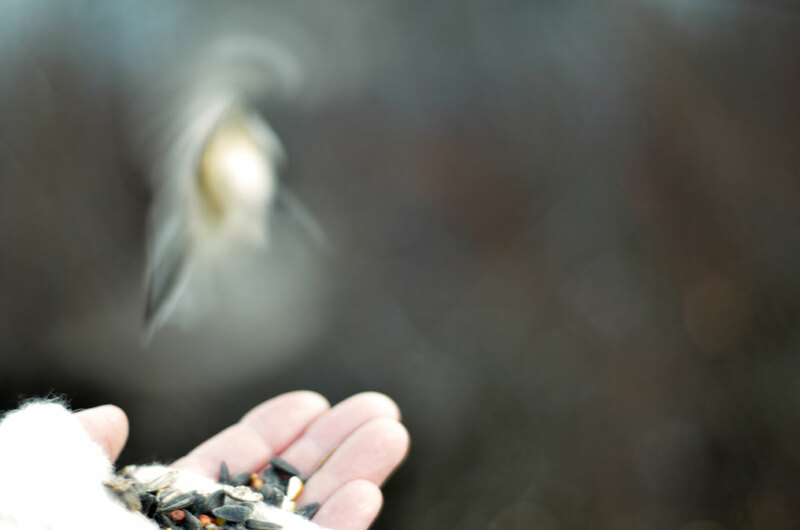 Thanks Karen – lovely images that do convey their fleeting presence. How indescribable the feeling of those feet on one’s hand is, but really it’s the whole presence – they live in a different time/space. But we have to remind ourselves that it’s not so different – we’re all sharing the same place! Such a lovely series. Indeed full of spirit. Made me happy, feeling the energy of the approaching bird.